The close proximity of the fans to the stage gives a nice intimate feel to the event. Back in 2009, Glenn Hughes played two nights in his beloved Wolverhampton, playing two special setlists - the first night was a collection of material from Glenn's solo career and Deep Purple, the second night was billed as 'An Evening Of Trapeze', playing a full set of their material in tribute to his former Trapeze band mate Mel Galley, who had passed away. I'd heard some of these concerts a while back, they've been available on iTunes a while as an "official bootleg". Now released via earMusic, fans have a chance to buy the shows on CD, and observe both nights on DVD. As a fan, this was great news for me - I was very curious to actually see the show, because to my surprise, when I interviewed Glenn last issue he told me he had bronchitis and pneumonia at the shows! There's very little evidence of that in the performance, I can tell you! The first show is a very good mix of material, featuring solo material culled from his most recent albums, such as 'You Got Soul', 'Crave', 'Love Communion', 'Stepping On', and 'Don't Let Me Bleed'. We are also treated to two Hughes/Thrall tracks, such as opener 'Muscle And Blood' and the rarely played gem 'Hold Out Your Life'. Talking of rarities, Glenn represents Purple with 'Mistreated' and the even rarer 'What's Going On Here' from 'Burn'. The band is superb, able to nail all these styles with ease. Glenn on bass is flanked by the excellent Jeff Kollman on guitar, Anders Olinder on keyboards and Steve Stephens on drums. It's a terrific line up and if anything, Glenn not being 100% means he goes easy on the screaming, so in actuality I prefer his performance here to some shows! He doesn't over do anything and if he hadn't told me, I'd never have guessed he was under the weather. The man is a true pro and a legend. The Trapeze set is also exquisite, breathing new life into some truly great seventies rock songs like 'Touch My Life', 'Black Cloud' and 'Medusa', alongside the funkier fare of 'Way Back To The Bone', 'Your Love Is Alright' and 'You Are The Music'. I love Trapeze and this line up really do the songs justice - plus Glenn pulls out some rarities here such as 'Good Love' which only ever appeared on a Trapeze compilation, and the powerhouse 'Jury'. If you want the 2CD set, be warned, each disk omits a song to fit everything on one disk. As for the DVD version, the audience lap it up and the close proximity of the fans to the stage gives a nice intimate feel to the event. 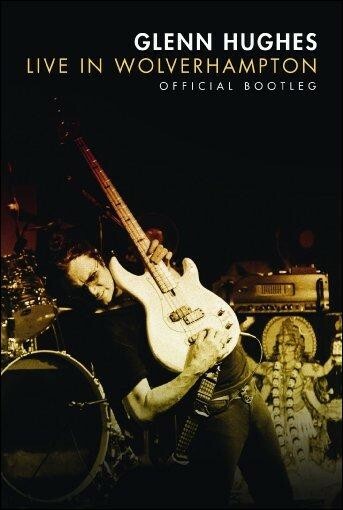 Some Purple fans might find this a bit too funky compared to the more recent material Glenn has done with Black Country Communion, but fans of Trapeze and Hughes solo stuff, like me, will love it.